Mechanic Diesel, Mechanic Motor Vehicle etc.) at Ahmedabad/ Vadodara Divisions of Western Railway. Total vacancies available in Vadodara Division are 229 and in Ahmedabad Division are 388 posts. Candidates fulfilling all mentioned eligible criteria need to go through www.wr.indianrailways.gov.in and download the application for relevant trade. Fill the required fields and submit before last date. Qualifications required for this Apprentices Jobs is 10th class pass and ITI from NCVT. Duration of training is one year. Ag of the candidate to undergo Apprentices training is 15 years to 24 years. Applicants other than SC/ ST/ PH/ Woman need to pay a postal order/ Demand Draft of Rs. 100/- as Application Processing fee. Selection for this Western Railway Recruitment is based on candidates marks percentage in 10th class and ITI examination. Further details of Western Railway, Ahmedabad/ Vadodara Division Apprentices Recruitment notification guidelines/ Instructions, Age limits, Application fee details are given below. 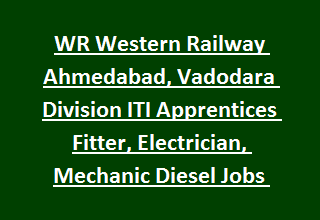 Available vacancies in Ahmedabad/ Vadodara Division Western Railway Recruitment are 617 posts. Educational qualifications for Apprentices Jobs is 10th class pass or equivalent qualification and ITI in relevant trade approved by NCVT. Minimum age limit is 15 years and maximum age limit is 24 years as on date of notification. Age relaxation for SC/ ST candidates is 05 years and 03 years for OBC candidates. Selected candidates will be paid stipend as per Central Apprenticeship Council. Mode of selection will be based on candidate merit percentage in Matriculation and ITI Examination. Merit list will be prepared by taking the average marks percentage in Matriculation and ITI Examination (equal weightage will be given for both). Application processing fee for all candidates (except SC/ST/ PH/ Woman) is Rs. 100/- payable to Sr. DFM/ Vadodara or Sr. DFM- Ahmedabad. Interested/ eligible candidates are requested to read the instructions before filling/ submitting application. For Vadodara Division: Last date for submitting application is 23-11-2017.